You invested a lot in your area rugs. Make sure that the folks that are cleaning them know what they are doing. Our team has the training and experience, we can handle even the toughest job. Give us a call at 349-0911. Do you know the difference between a spot and stain when it comes to your carpet? Troy visited with Renee Scott​ with Channel 2 News, KTUU.com​ to explain the difference. Take a few moments to make sure you are cleaning the spot and not making it worse. Watch here to find out how to treat spots and stains. Cleaning carpets is about more than vacuuming. There is a lot of chemistry at work when it comes to properly caring for area rugs and carpets. Our team has the education, training and experience you should trust. Anchorage KTUU Moms Everyday. Watch here to hear the full story. You have invested in a beautiful, artistic rug to serve as the focal point of your guest room or living room. As gorgeous as this piece may be, it is going to eventually need maintenance! People are going to walk on it, mistakes are going to happen, and the natural wear and tear of daily life will reduce the quality of your rug without professional help. The process of properly cleaning a rug is a bit more complicated than a wash and dry cycle. In order to maintain the day one look of your rug, you will need professional tools and a steady hand to operate them. The cleaning process will change depending on the materials that your rug is made from – wool, cotton and silk are cleaned slightly differently in order to preserve their original look. Special cleaning products that are less abrasive than over the counter detergents help to ensure that the color of the rug is preserved while lifting dirt and grime from the materials. A professional cleaning also uses a process that does not allow dirt and sediments to attach themselves to the rug after the wash cycle. This helps your rug to stay cleaner for a longer period of time. Getting your rug cleaned on a consistent basis helps to do more than keep up the look of your home. Rug cleanings help to remove allergens from the home, and the small bugs and parasites that naturally make their way into your home will find a home in your rug if you do not clean it consistently. A good, consistent cleaning will also ensure that any big spills do not fully embed themselves into the architecture of your rug. To keep your carpets from getting too dirty use mats inside and outside the threshold. Dirt becomes embedded into your carpet when you walk on it. Use your vacuum cleaner to get off the top dirt. When the dirt begins to make brown stains on the carpet it is time to call an expert. Maintaining the color and cleanliness of your rug is a top priority. Light cleaning can be done yourself provided you use the right tools and solutions correctly. Stains should be removed right away before they soak into the carpet fibers. Depending on the strength of the stains, Kool-Aid, pet stains, coffee stains, etc. you may have a real problem on your hands. Bleach discolors your carpets as well. This causes pale yellow or orange spots on your carpet. J&S can restore your carpets color to its original, vibrant color. We have a variety of colors and shades that will get your carpet looking brand new. Or, if you want a completely different color change we can do that too. We don’t consider stains just uneven color, we consider them to be color issues. We can guarantee that stains and discolorations are removed from your carpet for good. Carpet discoloration can result from overexposure to sunlight, chemical spills or fade spots from furniture or over cleaning. We can find the perfect color match no matter what shade or tone your carpet is at present. 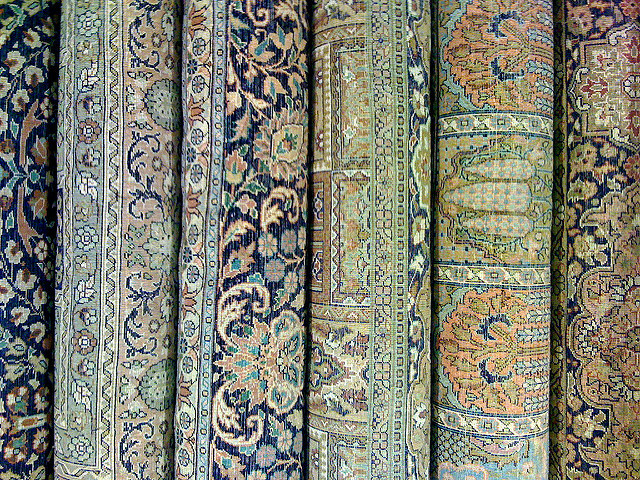 We are expert at coloring a variety of rug makes with intricate patterns such as Persian and Oriental Rugs for example. You don’t have to live with unsightly and unfashionable carpets with outmoded colors. Our services also extend to adding runners to your hallways and any other high-traffic areas as well. At J&S, we provide quality service and are experts who have restored hundreds of wonderful rugs of all grades and makes. Our custom airbrushing tools create beautiful artwork to achieve new decor. All our solutions are environmentally friendly and non-toxic. Our dyes are guaranteed never to fade and the rug coloring process dries so fast you will be able to walk on your rugs within the same day. Our carpets and rugs are our homes largest filters. The fibers collects soil, dead skin, dust mites, and allergens, which then work their way through the pile to the backing, where they build up over time. The Eureka company did a study several years ago and found that a 9’ x 12’ rug can hold up to 87 pounds of dirt! Regular vacuuming and surface cleaning are inadequate to address rugs with even a fraction of this level of soiling. The Rug Spa at J&S Steamway is Alaska’s premier Oriental and area rug cleaning facility. Our state-of-the-art, top of the line equipment provides the greatest opportunity to bring your rugs back to their original clean, healthy condition. We will determine as much as we possibly can about the type of rug and inherent qualities that may affect cleaning. We will outline the expected results and cleaning “prescription”. Our company will come to your home to pick up your rug, or you may drop it by our shop. Woven rugs, especially hand knotted rugs are designed to hide dry soil. We use a variety of techniques to “dust” the rugs from the front and back. A machine called a Rug Badger and special vacuum attachments are methods implemented to remove this soil build-up. This is the most important step in cleaning any textile. Depending on fiber content and soiling type, the rug will be pre-treated to emulsify the soils. Any potentially difficult spots will be pre-treated with special solutions to increase chances of removal. The fringe is also pre-treated for maximum soil removal. Depending on fiber content and soiling type, the rug will be pre-treated to emulsify the soiling. We will then select the people and pet friendly, environmentally safe cleaning solution best suited for your specific rug type, to ensure maximum cleaning while protecting sensitive natural fibers. Depending on the type of rug it will be rinsed with extraction equipment on both sides or washed in a wash pool designed especially for Oriental Rugs. Once the soil is rinsed away, the rug will enter our Rug Revolution for final rinsing and water extraction. This machine is a centrifuge which safely spins your rug at high revolution, extracting 98 percent of the remaining water and along with it any soil remaining after the cleaning process. Our high volume air movers and dehumidifiers will then quickly complete the drying process eliminating the risk of mildew development common with other rug cleaning methods. When the rug is dry, it is combed and finished with soft groomers made for specialty rugs. Our cleaning specialist will give the rug a final inspection and release it for pick up or delivery. Your rug will be wrapped in brown craft paper or plastic bag to protect it while in transport. Upon delivery, we will lay the rug for you. Soil Filtration is the discoloration of carpet due to the passage of air through carpet fibers in concentrated areas. It is most common along baseboards on perimeter walls. Gaps between the bottom wall plate and the subfloor allow the passage of air thru the carpet. The carpet along the base acts as a filter where soil particulate is deposited. Filtration lines can also develop under doors that are left closed for long periods of time, and around any wall penetrations such as gas piping and ducting. Can Soil Filtration lines be removed? The ability of your professional carpet cleaner to remove these lines varies depending on the type and amount of soil, length of time the soil has been accumulating, amount of airflow, and the color and type of carpet fiber. The discoloration can be removed from most synthetic fibers. However, in severe cases, especially on light colored carpets, traces may remain after cleaning. It is usually very difficult to completely remove filtration soiling from wool or olefin carpets. What can you expect from J&S Steamway? Our technicians are experienced, educated, and armed with state-of-the-art equipment and solutions. Your tech will inspect your carpet, explain the recommended treatment, and let you know up front what you should expect from the cleaning. What we will not do is over-promise and under-deliver. It is our goal to provide you the best possible information with which to make your decisions.